by Richard R. Forberg, Vice President, Product Management, STM Group, Inc. The RCS2 standard was published by the DVB organization in 2011 based on collaborative work by many leading industry participants. Both the specification and implementation are the result of three years of advanced development, in which STM was a key technology contributor, leading several research organizations under contract to the European Space Agency (ESA). The base of the new RCS2 standard is, of course, DVB-RCS (Digital Video Broadcast with Return Channel via Satellite), the worldwide open standard for satellite network specifications that carriers, militaries, and businesses have come to rely on for advanced, high quality services. It uses Multi Frequency Time Division Multiple Access (TDMA) and Time Division Multiplexing (TDM) methods for two-way communications. It has been used commercially since 2001 by hundreds of companies and government agencies. The new RCS2 standard is now being deployed in Q1 of 2012, giving operators the latest satellite waveform technologies for modulation and coding, plus many other useful features. To appreciate RCS2, it is necessary to understand the foundation first. The DVB-RCS standard is all about implementing very fast, efficient and reliable Internet Protocol (IP) networks using Very Small Aperture Terminals (VSATs)or larger ones, if necessary. DVB-RCS provides excellent support for fixed, transportable, and mobile VSATs with high-throughput communications. Communications-On-The-Move (COTM) is delivered for ships, off-road vehicles, high speed trains, and aircraft with roaming across beams and countermeasures against interference. DVB-RCS works with any type of fixed, auto-pointing, electronic array, or stabilized antenna systems in any satellite band or beam configuration. DVB-RCS specifies use of the popular DVB-S2 standard for the Time Division Multiplexed (TDM) carriers in continuous mode, which can be broadcast to hundreds or thousands of remote VSATs from a central hub, gateway, or master station. It then also specifies the advanced TDMA control logic, precise burst synchronization (down to 37 nanoseconds), modulation and coding, plus fast frequency-hopping used on TDMA carriers. Timeslots may be allocated to a given VSAT statically and/or dynamically (i.e. as bandwidth-on-demand) in any mixture determined by policies set by network operators for different applications or traffic types. Applications requiring any combination of VoIP, video conferencing, video feeds and/or video multicasting, plus any type of data application can be served with a single VSAT. Each capacity request from the VSAT for bandwidth-on-demand may distinguish the QoS treatment required for the service. DVB-RCS is ideal for remote operations that need huge transmit bandwidths rapidly but unpredictably. A TDMA carrier group can have dozens of carriers creating a massive pool of shared bandwidth for return and mesh link communications. Up to 44 MHz of shared TDMA capacity is feasible in commercial implementations today that use wide-band, multi-carrier burst demodulators, with double that coming soon. This is in contrast to most proprietary TDMA systems which are limited to < 8 MHz of shared bandwidth for TDMA access. In the latest commercial Return Link System (RLS) burst demodulators, all 44 MHz can be digitized and processed for up to 32 concurrent bursts in a 1U rack-mounted unit for reception at the hub or a number of gateway stations providing 50 Mbps of IP throughput on TDMA carriers. This also enables high-capacity, high-performance hub/gateway systems, easily transported to the theater of operation. Mesh networking capabilities, available in commercial DVB-RCS implementations today, over these same TDMA carrier groups, enable single-hop communications between small remote VSATs with capacity for demodulating eight (8) concurrent bursts. Mesh networking also supports bandwidth-on-demand with multiple QoS Class on every active mesh link, if desired. In recent years, Adaptive Coding and Modulation (ACM) on DVB-S2 carriers operating at information rates well over 100 Mbps in TDM mode has proven to be a key advantage in many networks, often doubling the TDM carrier capacity and greatly improving TDM link availability. It is DVB-RCS, however, that specifies how ACM on DVB-S2 is implemented optimally with rapid closed-loop control using the same signaling messages that handle closed-loop synchronization and capacity requests for TDMA timeslots. In DVB-RCS, the modulation, coding, and symbol rates on TDMA bursts are also handled adaptively, in real-time, using intelligent carrier selection in the TDMA controller at the hub. This completes increased link availabilities and average information rates obtainable for two way communications, and delivers better gains than todays proprietary adaptive methods, because of the larger dynamic ranges supported. This allows VSATs to perform fast frequency hopping across a wide range of TDMA carriers, operating, say, from 500 ksps up to 8 Msps in a highly reliable manner. Other features in the leading commercial DVB-RCS implementations at higher layers include: built-in TCP and HTTP acceleration, Network Address Translation (NAT), and header compression of IP stack protocols. These are essential for high-performance, flexible networking. Many aspects of such features are now gradually being standardized by efforts in the DVB Higher Layers for Satellite (HLS) working group, in close coordination with the RCS working group. Transmit capacities over 12 Mbps of IP content from a low-cost VSAT are feasible in todays low-cost commercial implementations of DVB-RCS; and the receive capacities for total IP content over DVB-S2 to a single VSAT can reach 50 Mbps. Of course, throughput always depends on signal-to-noise ratios (SNR), which in turn depends on antennas, amplifiers, and many other factors including satellite characteristics and atmospheric fading, especially in higher frequency bands such as Ku- and Ka-. This is where the Second Generation of DVB-RCS becomes especially important. The major advance in DVB-RCS specifications to DVB-RCS2 offers 8PSK and 16QAM modulation options, as well as the usual QPSK. It also uses a new, powerful 2D 16-state Turbo Code FEC algorithm in TDMA bursts, giving up to 2 dB more gain. Selected alternative modem specifications (e.g., for non-linear modulation) are also allowed but yield lower efficiency. VSAT log-on signaling now handles an even wider-range of diverse terminal capabilities via auto-discovery, promoting simplicity of operation in networks with diverse terminal types, including some or all using encryption. Particularly important is that ACM is now also implemented on the TDMA carriers for each timeslot (i.e., per burst). This is done in combination with the dynamic adaptive carrier selection already in use today. TDMA carriers, theref ore, have no defined modulation and coding until a timeslot is assigned on them to a given VSAT. Even the symbol rates and the number of carriers in the TDMA carrier group may be dynamically adjusted, given the flexible superframe and frame formats in the new standard. All this gives an additional dramatic improvement in average network capacity and link availability over TDMA carriers in high-frequency networks (e.g., Ka band), without increasing antenna sizes. With these advances, the transmit capacities from a low-cost VSAT will reach 24 Mbps of IP content in the near term, with more in the years to come. Another benefit comes from new methods for encapsulating IP packets into TDMA bursts and on DVB-S2 carriers, which reduce layer 2 overheads to the bare minimum and eliminate MPEG overheads, while retaining flexibility for diverse Layer 3 protocols, such as IPv6 and IPv4 running concurrently over the same carriers. The upgrade to DVB-RCS2 is a game-changer in the satellite communications industry, raising the bar for efficiency and speed while remaining a trusted, open standard. With improvements across several key aspects of the DVB-RCS specifications, RCS2 will be a valuable asset across many market sectors. With several hubs already set to upgrade, it is clear that there is great interest and appreciation for the increasing performance and efficiency for networks and applications of all types. 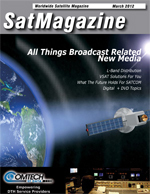 In the summer of 2011, STM became the first to implement the new DVB-RCS2 standard on the SatLink® platform in a demonstration attended by representatives of the European Space Agency (ESA) and the Norwegian Space Center. STMs implementation of RCS2 yields bandwidth efficiencies up to ~2.9 bps/Hz (3.33 bits/symbol) on TDMA carriers and offers excellent return link availability with ACM, as is critical for new broadband networks. Hubs owned by NSSLGlobal, Ltd. and Global IP will be among the first to offer RCS2 services through their SatLink hubs. Chief among the motivations to upgrade were RCS2s high throughput for IP packets on the return link and the capability of having higher link availability and efficiency than ever before. The hubs are also part of each companys plans to increase their coverage area, which can be done without requiring additional transponder capacity from the satellite. The newly upgraded RCS2 hubs will provide solutions for high-speed Internet Access, TV/Video services, VoIP, and GSM backhaul used by the maritime industry, energy sector, utility companies, and global corporations. All of these services can operate on the same VSAT with excellent QoS.